A few weeks ago, I was dreaming of sitting by the river, eating tapas in the open air at La Terrassa, and then walking the short distance to Jazz Dock to catch a show. That dream was temporarily washed away by this spring's floods, which damaged both riverside businesses. It's not completely clear when they will reopen, but La Terrassa is aiming for the end of June and Jazz Dock hopes to be back in business in mid-July. Prague is not exactly overflowing with top tapas choices. When you are hungering for some small interesting dishes that won't drain your bank account, Room Tapas Bar near Wenceslas Square is an option worth considering. It is part of The Icon Hotel and Lounge. Entering from the street takes you to the modern, brightly-colored, brightly-lit front dining area, which was non-smoking. A number of menu items were written on the wall by the bar. 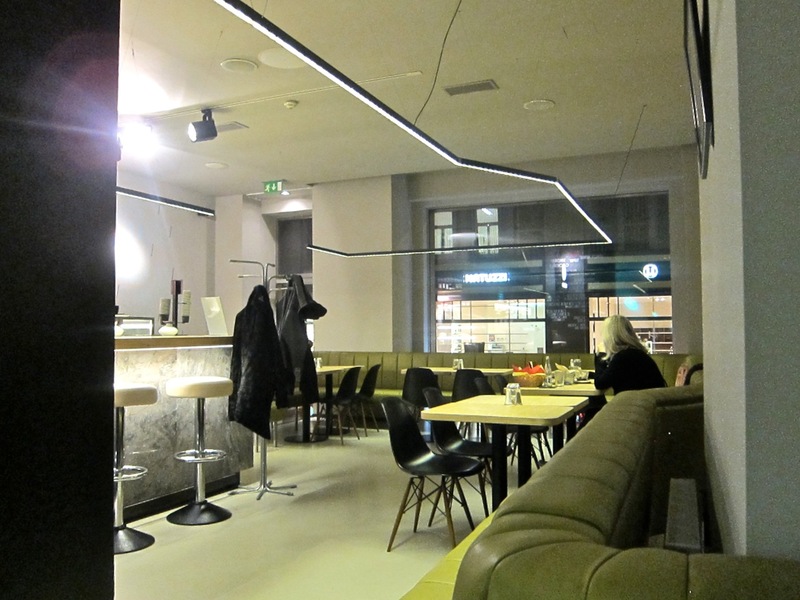 There were blond-wood veneer tables, black plastic chairs, and electric green banquettes. I'm not sure what to call this type of modernism, but it clashed too much for my taste. The back room was cooler-looking, with a lounge vibe and an eclectic mix of comfortable furniture, including bed-like seating. The music varied between electronic and what sounded like some type of flamenco. This was the smoking area, so I never sat there. I've visited four times this year and had many of their offerings. They often start you off with a free taste of something. On one visit, it was what they call Spanish omelet, also known as tortilla de patata. 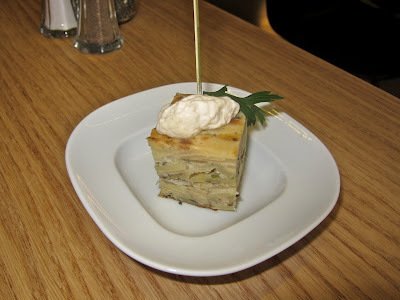 The thinly sliced potato was very fresh with sweet fried onion mixed in. It was topped with a garlicky aioli. On another visit, we received pitted black and green olives. I really liked the red sangria. 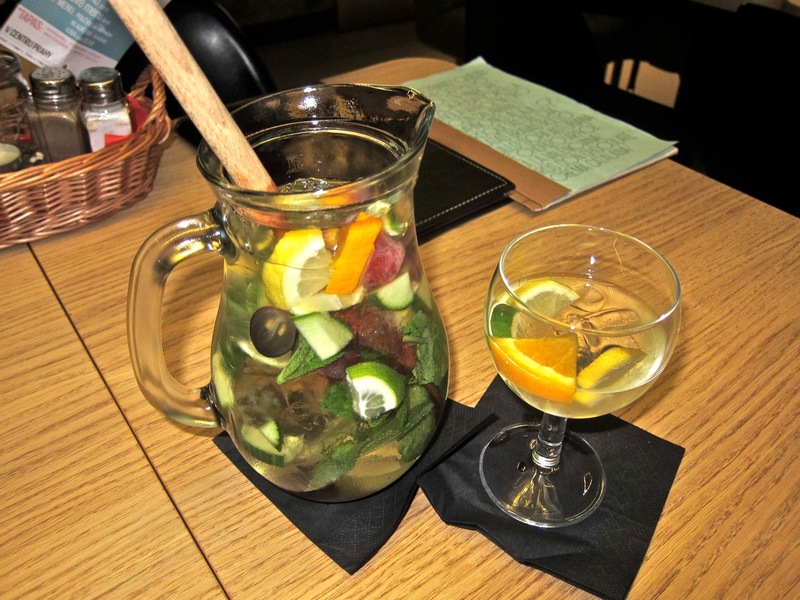 You can order a 1 liter pitcher (230 CZ) or a half-liter jar (140 CZK). It's sweet, but not too sweet, with tangy citrus and cinnamon notes. The menu says it includes strawberry liqueur, triple sec, and brandy. It does have a complexity to it. My overall favorite dish was the grilled octopus (170 CZK). The tentacle was charred and crispy on the outside and so tender on the inside. 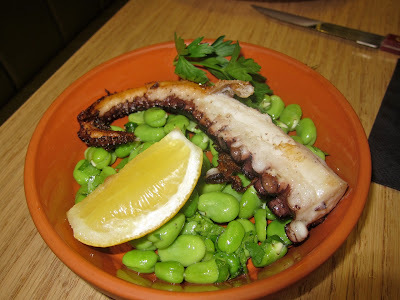 It was paired with raw, lightly lemony fava beans mixed with parsley, making for an interesting contrast. I loved it so much on the first visit, I got a double order on my second visit. 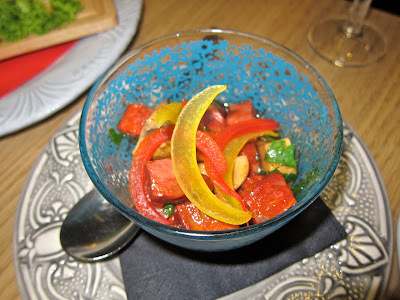 Less successful, was the octopus vinaigrette the octopus vinaigrette (65 CZK). 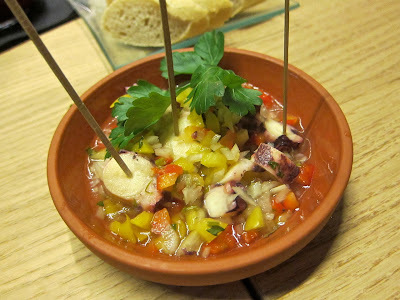 The octopus, mixed with red and yellow peppers, was chewier. The vinaigrette was just too sour for me. 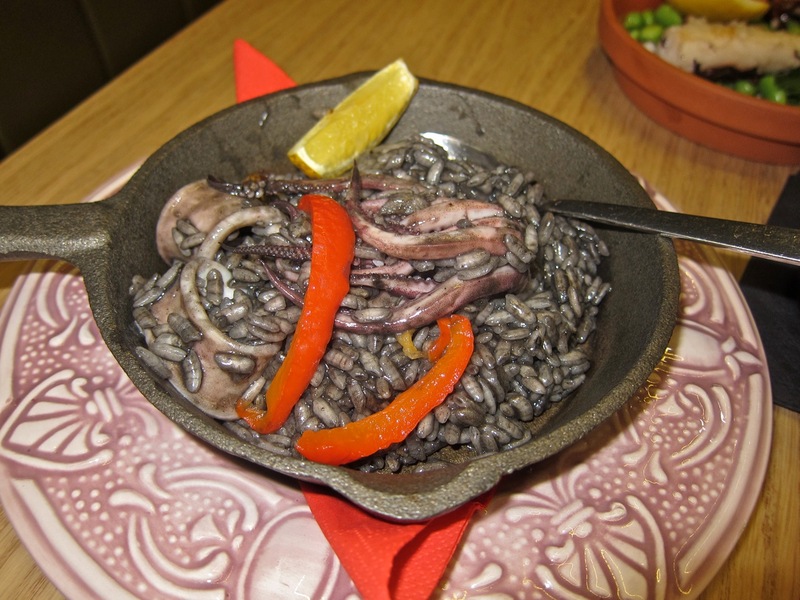 I enjoyed the black rice with squid (70 CZK). Served in a cast iron pan, the squid was tender and the al dente rice had a wonderfully buttery flavor that was complemented by a squeeze of the accompanying lemon. 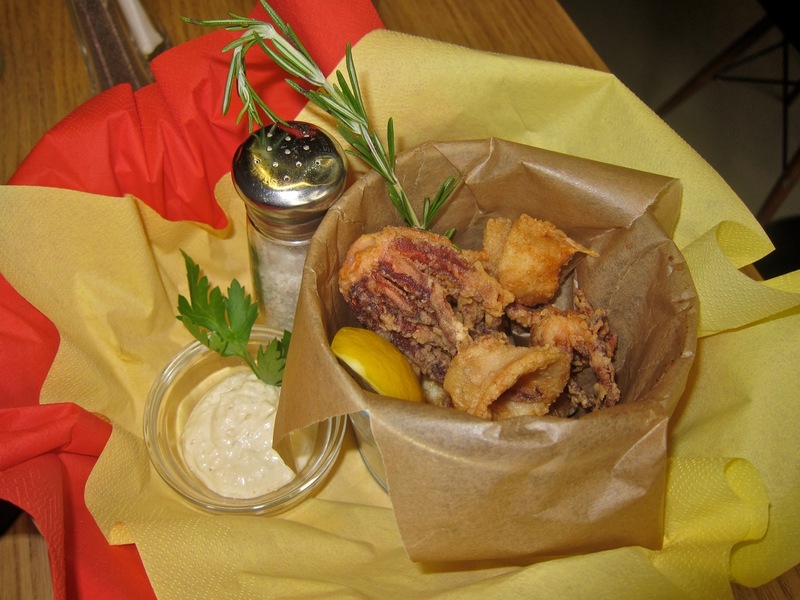 Good quality, freshly-fried calamari is hard to find in Prague. 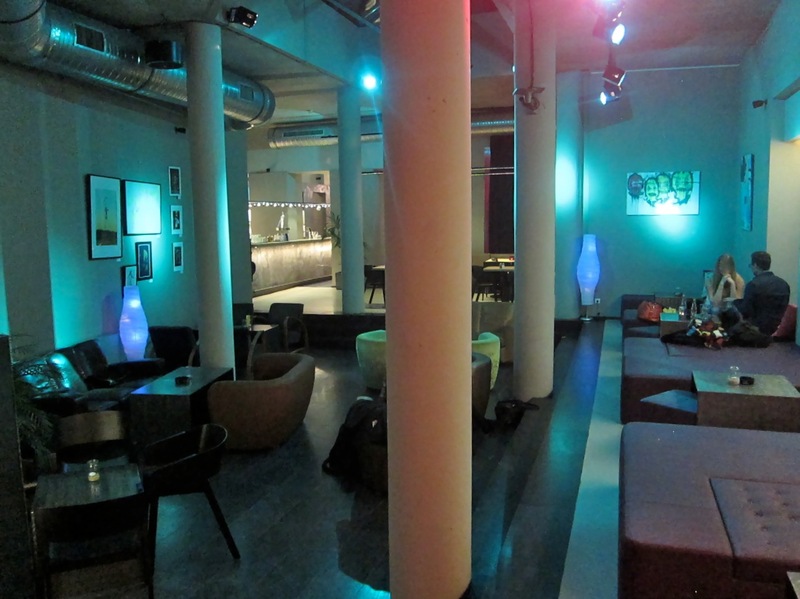 They have it at Room (150 CZK), and it can be great. The mushroom and sausage in red wine sauce (100 CZK) was an interesting combination. The tasty sauce and blander mushrooms balanced out the salty, chorizo-like sausage. On one visit, we tried the white sangria, which has the same prices as the red. This one was also refreshing and not too sweet. The menu said it was made with white wine, vodka, vanilla sugar, fresh limes and lemon, strawberries, grapes, mint, cinnamon, cloves, lemonade. I didn't see strawberries in this one, but cucumber slices made an unannounced appearance. I liked it just as much as the red, if not more. 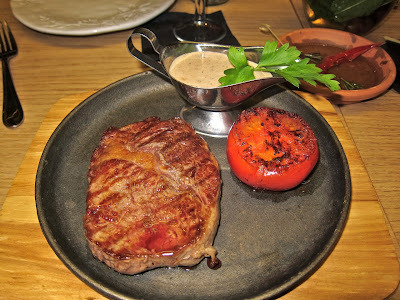 I can recommend the Argentinian entrecote with green pepper sauce (350 CZK). The 250 gram steak was so easy to slice, so easy to eat, especially with the creamy sauce that complemented it. After chewing hard on so many tough cuts of beef this year, this one was a tender pleasure. It was cooked exactly medium rare, as requested. It had a streak of fat through the middle as rib eyes do, which adds to the flavor. 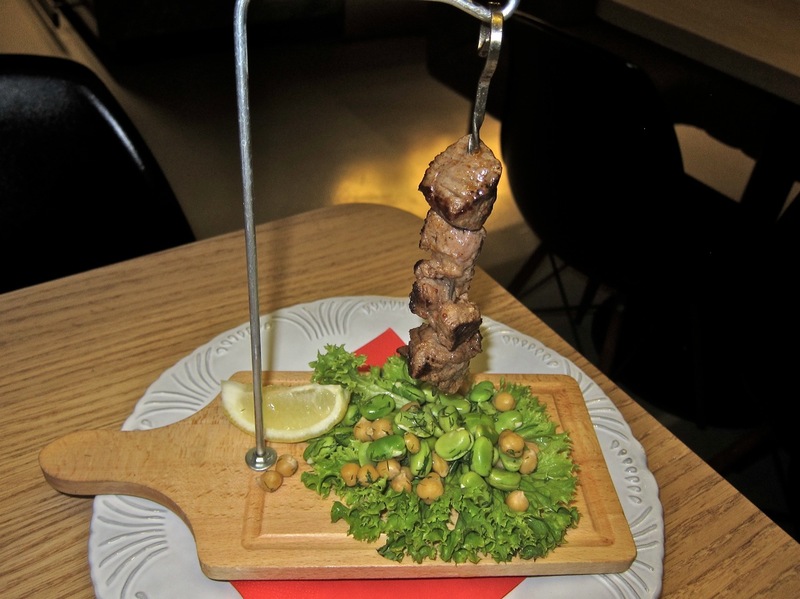 If you don't want a steak, the marinated beef skewer (170 CZK) is a good way to go. The meat was also tender, but it had more char flavor from the grill. The chunks hung above a small salad of chickpeas and fava beans. We sampled a number of desserts. The one I looked forward to the most did not meet my high expectations. 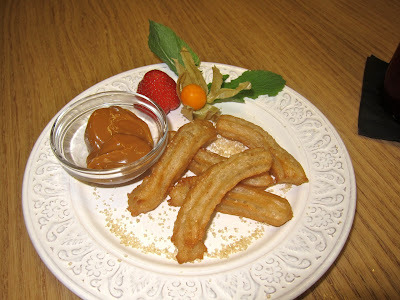 Room is one of the few places in Prague to offer churros (55 CZK). The five fried, pieces of dough were crispy, but not quite crisp enough on the outside, and there was too much gooey, unfried batter on the inside. Oddly, they were topped with cane sugar that, for the most part, did not stick to the churros. On the positive side, it came with seriously amazing dulce de leche, rather than the chocolate sauce stated on the menu. 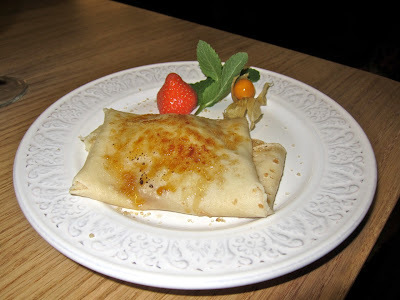 A better option was their freshly-made pancake filled with the same dulce de leche. The top had a coating of burnt sugar, giving it creme brulee-like taste. Do you self a favor. Try it. 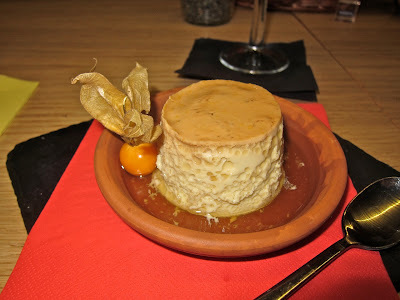 The last dessert I tried was the orange flan (55 CZK). The custard had a very light orange syrup over the top. I liked that it didn't have too much sugar in it. This was another good way to end a meal of dulce de leche is not your speed. The service was friendly and efficient, except for a couple of moments when our waiter on one visit disappeared for a fair amount of time. If you are lucky, you will be attended to by an Argentinian gentleman named Juan, who is one of the more friendly and charming servers you'll come across in this city. He told me they are planning a further expansion of their menu. 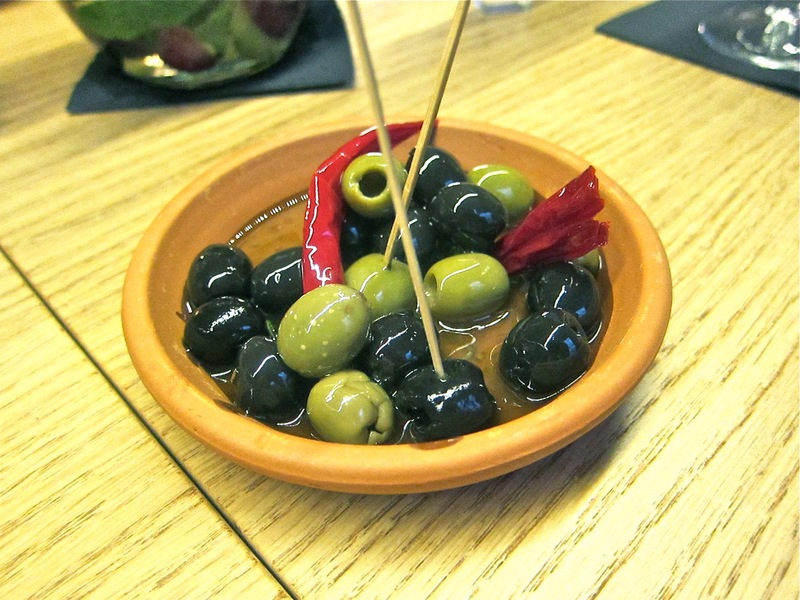 People can argue about the definition of tapas and whether these dishes qualify. They can take issue with whether the tapas is more Argentinian or Spanish. I don't care much about all that. I just want to enjoy well-executed cooking and feel well-taken care of. And I think Room Tapas Bar is serving some of the tastier little plates you'll find in Prague right now. Beautiful decor here, I love the colours...and the food looks fantastic. 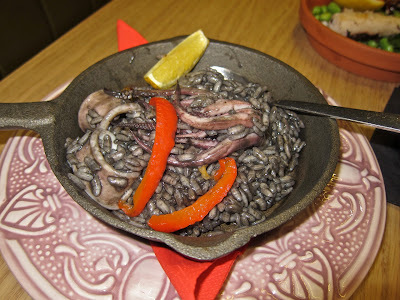 I love their black rice and squid, such a shame the place is almost always empty..
Great Review. Like the Icon. Went there a Few Years ago, for a Art Show. Will be Going Here for Tapas. When back in August. Also Like El Barrio De Angel. Thanks. 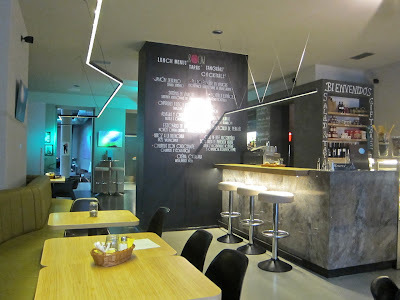 I recently discovered your amazing blog and now it is my official guide when I want to try a new restaurant in Prague. 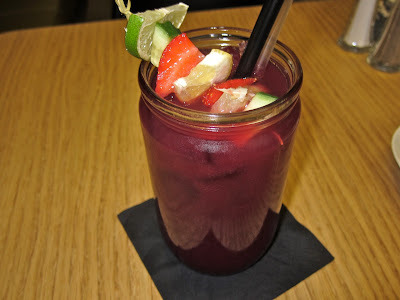 I tried Room last month and was enthousiastic about both sangrias. Loved the athmosphere too. Will definitely come back!